‘Seri’ is known as Japanese parsley or Oenanthe javanicaW in English, a plant of water dropwortW genus which has been one of the long time familiarized food plant. This plant is one of the ingredients used in traditional congeeW on 7th January. The phrase is followed by the word ‘sunawachi’ meaning whereupon and the last verb, ‘sakau’ meaning ‘to flourish. Therefore the full meaning of this phrase would be; the Japanese parsley, whereupon flourish. It sounded strange to us when we read this phrase well because of the word ‘flourish’ which doesn’t match the season so we looked up at some of the materials on this plant, Japanese parsley, to find whether this plant really flourish in this time of the year in Japan. The plant seems to be tough against the cold Japanese weather though its season is from February to April. The largest Japanese parsley producing districts are Miyagi prefectureW and Ibaragi prefectureW, producing 60% of the Japanese parsley in Japan. Still, the Japanese parsleys in the market at this time of the year are produced in the hothouses and not on the open-fields. The open-field crops first appear in March which is finally the real time for the ‘Seri’ to flourish in nature. 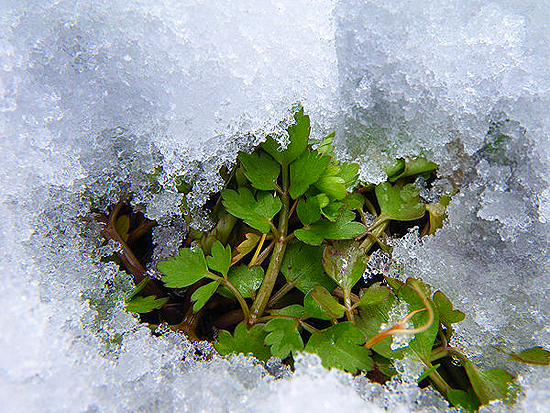 ‘Seri’, Japanese parsley showing between snow. Photo from ‘Tabi no kaori‘ by fuefukin. So, why did they use the word ‘flourish’ to express the ‘Seri’ at this time of the year? ‘Seri’, Japanese parsley, has long been a food plant in Japan which can be easily collected in the nature. Even today, in the countryside, there are some, still collecting wild ‘Seri’ for their own cuisine or from their kitchen garden. We are sure people in the old days were more alert to this little plant growing in wild in their wild territories or in their gardens which caught their eyes especially in cold winter when there are less fresh green food plants. This is nothing but our own hypothesis but we are sure that this food plant, compared to other plants in the cold looked more vigorous as they are tough against the cold weather, used the word ‘flourish’ to express their condition though it wasn’t yet their season. By expressing so, we assume people should have been cheered up by thinking that the coldest season wouldn’t be so long. There are 5 days of events which mark the stages of traditional annual functions in the year in Japan. The 5 special days are called ‘Sekku’ in Japanese and are one of the many ‘Koyomi‘ that we have. The 5 Sekku are as below. The first Sekku of the year is the ‘Nanakusa-no-sekkuW‘ which is a Sekku celebrated with seven spring herbs or food plants put in the congee wishing for longevity and health throughout the year. The origin of ‘Nanakusa-no-sekku’ may have been ‘Wakana tsumi’, a tradition in ancient Japanese Imperial Court of an event picking shooting out sprouts of the wild herbs between the layers of snow on the day of Rat (one of the days calculated in Earthly BranchesW calendar) at this time of the year. It is said that this tradition was combined to the Chinese originated custom of Six DynastiesW period eating soup or stew with seven vegetables and praying for health, later became the tradition of the Nanakusa-no-sekku. 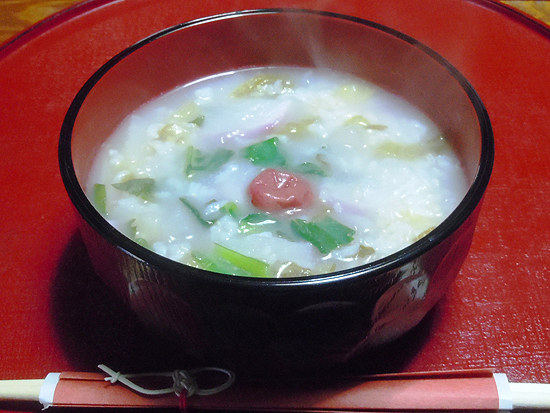 Congee with 7 spring herbs, ‘Nanakusa-gayu’. Photo by eejirow, Photozou. Though the tradition of Nanakusa-no-sekku is quite old, the seven herbs noted as they are today first appear in the book of ‘Kaiisho’, an annotated edition of ‘The Tale of GenjiW’ in 1362. Before then, this special congee appeared as ‘Mochi-gayu’, meaning congee of hope as well as congee with rice cakes which had seven different grains and beans instead of herbs and food plants. There is also an ancient record saying that a congee with Azuki beansW (you can find the article on Touoji, Shokou) was served on 15th January which also had the meaning of getting rid of the evil spirits and wishing for one’s health. 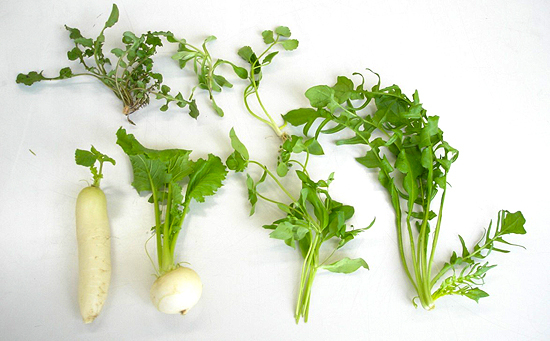 Seven spring herbs of ‘Nanakusa-no-sekku’. Water dropwort, shepherd’s purse, cudweed, chickweed, nipplewort, Turnip and raddish. Photo from ‘Teinen taishokugo no tanoshimikata‘. You may see that there are several origins attached to form what we still follow today in eating congee with seven herbs on 7th January which many Japanese are not so sure of. Still, it is an event right after the New Year’s celebration wishing for one’s health throughout the year as well as giving a little rest to the stomach that’s been full of rich New Year’s celebration food. Seven herbs are sold in supermarkets in a plastic pack at this time of the year in Japan so that you don’t have to wander about in the fields in freezing weather collecting them! ‘Two carps in waterfall’ by Katsushika Hokusai. The wild original of KoiW, carps were found in lakes, ponds and rivers all over Japan and were one of the precious source of protein in the areas not facing the sea. 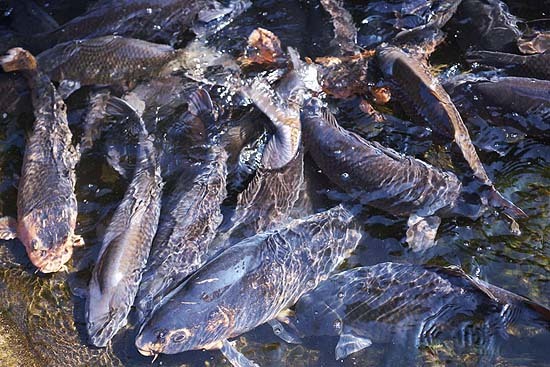 They were cooked on special occasions because carps are thought to be lucky fish. It is thought lucky because according to ‘Gokanjo (Book of the Later HanW)’, one of 24 dynastic histories of Chinese official history, a lot of fish tried to swim up a waterfall called ‘Ryumon’ in the rapid stream of the Yellow River, but only carp could wax on and thus became a dragon! 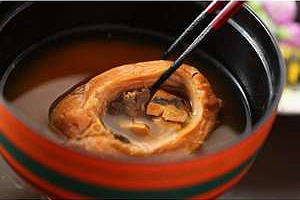 The famous cuisine of carp in Japan is ‘Koi-koku’, a carp cooked in thick misoW soup which was one of the popular dish in Edo periodW. Freshwater fish cooked in thick miso soup was called ‘Kokusho’. There were varieties of Kokushos in Edo period as UnagiW, Chinese softshell turtleW and CarassiusW but only ‘Koi-koku’ remained until today because the dish had lucky meaning. The dish was also thought to be good for women who breast-feed as the nutrition of the Koi-koku were good for breasts giving milk. Bowl of ‘Koi-koku’. Photo from Oyado Suminoyu official site. Koi-koku is not as popular dish as it used to be but you can still find some Japanese restaurants serving their best dish at this time of the year. In Hiroshima prefectureW, there is an area where there still is a tradition to cook Koi-koku for the one you adore, letting him or her know that you love him / her. This tradition may have came from the origin of the word ‘carp’ in Japanese, “koi”. There is another word having the same pronunciation meaning ‘love’ in Japanese. There is an interesting story written in ‘Keikouki’, a history which is said to be written by Emperor KeikoW (though most of the description inside the book is thought to be fiction). It was Emperor Keiko who named the carp ‘Koi’ after the carp which he let go of in the pond of the palace to attract the beautiful lady he was in love with. He succeeded in conquest of the lady, happily naming the fish ‘koi’ after that. Carp, carp, carp! Photo by (c)Tomo.Yun. Koi now is not so familiar in house cuisine but in the world of Japanese poetry as haikuW, ‘koi’ appears often to present the season as well as in special traditional Japanese restaurants at this time of the year.